How to Convert and Copy a DVD to Your PC, iOS and Android Gadgets? Sometimes, you may want a copy of your DVD collection on your computer. Therefore you can watch it at any time, and don’t have to necessarily have the DVD disc on hand every time. Or perhaps, you need to make a backup of DVD just in case of losing the DVD content when it’s damaged. To meet the demands, we highly recommend a program that allows you to copy protected DVDs on your PC and convert the content into one of common formats. That is WonderFox DVD Ripper Pro, which is excellent and can accomplish copying a DVD to your computer with just a few steps. Note: WonderFox DVD Ripper Pro can be used to keep backups of your purchased DVDs for personal use. Please don’t use it for illegal sale. Now, let’s start to learn more about the program. And also, here below is how to copy and convert a protected DVD to your PC with WonderFox DVD Ripper Pro. WonderFox DVD Ripper Pro is one of the best Windows 10 DVD Ripper programs which help you create copies of DVDs and save them to your computer and portable devices. It is an alternative to HandBrake and DVD Shrink, giving the user the possibility to enjoy safe DVD movie backup without difficulty. The software is full-featured. And after installing the program, you can see that it has an intuitive interface. There are 3 source options: DVD Disc, ISO Image, and DVD Folder. That means it can also convert and copy video_ts to MP4, MOV, and more common formats. We press the DVD Disc button. And the program begins to analyze and decrypts the DVD. The time for analyzing depends on DVD data amount, your hard drive, etc. After a little while, we’ll see a new interface. See the image below. The program has already selected the right main movie of the DVD. Well, you can also choose the other content, such as Ads, to meet the best of your own needs. And then you can convert it to a video format from its supported format lists on the right, including MP4, AVI, H.264, MPG, MKV, MOV and more. Besides, converting movie to audio like MP3, WAV, FLAV, ALAC, DTS, AAC, etc. is also available. An interesting feature is that WonderFox DVD Ripper Pro can convert DVD to formats compatible with a wide range of gadgets such as iPhone, iPad, Apple TV, Samsung phones and tablets, HUAWEI devices, Windows Phone and other models of Android smartphones and tablets.After choosing a target output format or profile, press RUN at the right bottom. 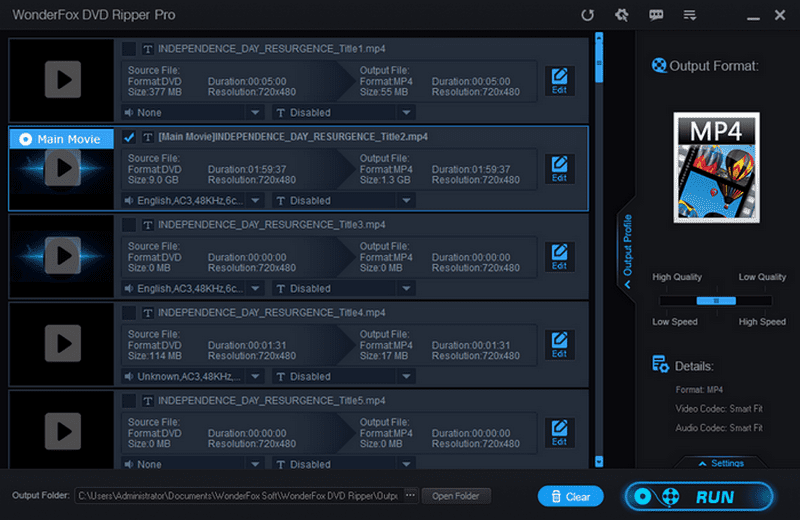 WonderFox DVD Ripper Pro provides the best, quickest and easiest way to convert DVD to digital copy. Readers of this review can take advantage of a time-limited offer to get a licensed copy with 50% discount.